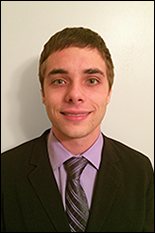 Fischell Department of Bioengineering (BioE) third-year graduate student John Schardt was awarded a joint University of Maryland-National Cancer Institute (UMD-NCI) Cancer Research Training Fellowship. The award carries tuition remission, a full stipend, and funding for lab supplies for one year, with potential renewal. Schardt, a student in BioE Assistant Professor Steven Jay's Vascular Pharmacoengineering and Biotherapeutics Laboratory, was recognized for his efforts to develop a novel molecular engineering approach to breast and ovarian cancer therapy. Schardt's project involves designing a strategy to overcome dysregulation of signaling between protein ligands and their cell surface receptors - specialized integral membrane proteins that communicate signals between the cell and the outside world - which can lead to tumor growth and metastasis in many cancers. One example of this dysregulation, which is especially prevalent in breast and ovarian cancers, is the overexpression of the receptor HER3. This overexpression often leads to amplification of HER3 signaling pathways, which generally cause negative outcomes such as tumor progression and/or metastasis. Along with Jay, UMD principal investigator on the project, and Dr. Stanley Lipkowitz, NCI principal investigator, Schardt has helped pioneer a strategy to inhibit HER3 signaling in cancer referred to as “HER3 sequestration.” Their technique involves engineering multivalent HER3 ligands to trap HER3 into configurations that prevent its interaction with other receptors that are necessary to initiate pro-neoplastic signaling. Through the fellowship, Schardt will employ computational protein design and cancer biology experimental approaches to better understand and enhance HER3 sequestration towards the development of a next generation of multivalent HER3 ligands that could be translated into novel cancer therapeutics. The UMD-NCI Partnership for Cancer Technology was established to bring together the expertise and resources in the mathematical sciences, physical sciences, and engineering at the University of Maryland with basic, clinical, and translational research expertise of the National Cancer Institute/Center for Cancer Research to solve the most pressing problems in cancer research. The partnership was officially formed in May 2010. More information is available online.